​Setting the new standard for static welfare units, we bring outstanding accommodation, comfort, and storage together for a team of 17. Designed to be compact, lightweight and easy to use, it’s suitable for almost any environment. 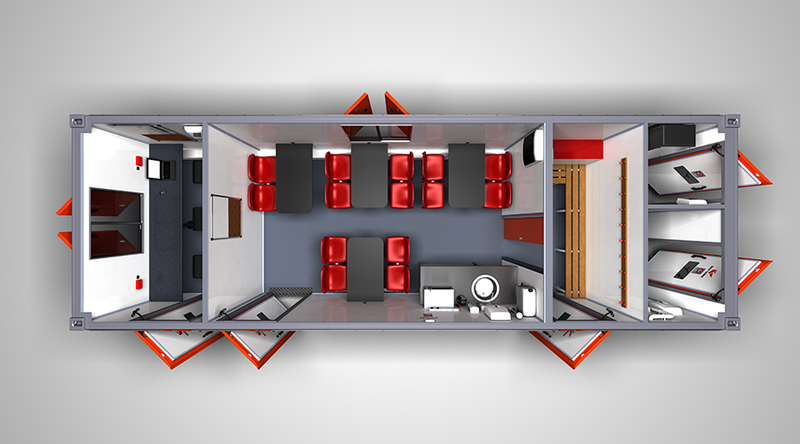 Our Canteen & Office Space welfare cabin provides seating for up to seventeen people, in comfort. It has plenty of dedicated storage, as well as individual personal storage compartments. Seating to accommodate 14, dedicated wall storage compartments, 2kw ceiling mounted heater, catering grade stainless steel worktops, microwave, forearm sink with hot-wash, towel and soap dispensers, window with security shutter. Diesel generator, tubular heater, coat hooks. Desk space for three people with storage shelves under, three double sockets, three office chairs. Optional full stainless steel build. Operates from as little as £0.56 worth of fuel a day with our Eco Ultimate electrical system. Full steel, 3 bolt, high-security door with anti-prise strips and magnetic door stays. Annual Safety Inspection – Designed to ensure the safe operation of all makes of welfare cabins, making sure you stay safe and within the law.